The mercury was barely at 10° F on Tuesday. Nonetheless, the sixth graders bundled up and tromped out for their monthly visit to their Weather, Woods, and Water study site on Grant Brook. They made many amazing discoveries about water, the woods , and snowy weather. On the way to the brook, the children stopped by the Great Stone to hear a story about the origin of the wind. They discovered a downed tree in the trail which they helped Mr. Pendleton clear away. When the students arrived at Grant Brook, they were amazed to discover a thick layer of ice that had covered the hiking trail and the brook's channel had moved about 30 yards to the north because of the heavy rain fall last week. The children recorded air, water, and soil temperatures with the data loggers and explored the changed landscape. 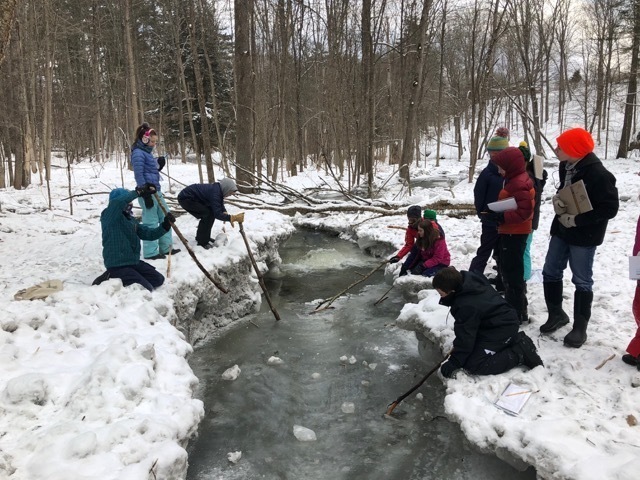 Several students dipped tree limbs into the rushing brook and saw ice form almost instantly when the wet sticks were exposed to the air. The class took temperatures at different snow depths and discovered the snow was warmer the closer the thermometer was to the ground. In fact, the ground surface was barely above freezing while the snow surface was at 9° F.
After a short sit spot session where the children envisioned life as a winter animal, the group warmed up with a brisk walk back to school for hot chocolate and a story.